Burgos is one of the most well-known cities in the north of Spain. 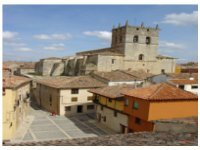 Located in the autonomous community of Castile and León, it used to be its capital, but was replaced by Valladolid during the XV century. Its history is very rich, especially concerning wars. During the Spanish dictatorship, it was the base of Franco’s Nationalist government. Another historical fact is the Reconquista with the famous figure of the Cid Campeador. The city is also known to be a step on the road to Saint Jacques of Compostelle. The city’s architecture, especially its numerous churches, reflects all these historical events. In the city centre and more precisely around the cathedral, you can find many bars and pubs where you can, among other things, eat tapas. A few famous places open at night: las Bernadas, las Calzadas or las Llanas. Burgos only has a few places to go shopping; however,you can still find shops in the Avenida de Valencia, and you can also hang out in the streets. In Burgos, you will find a lot of churches, amonst them the Gothic Cathedral of Saint Mary, where you can find Cid Campeador’s relics. There is also the museum of Human Evolution that presents the story of the first Europeans who lived in this area a long time ago. Finally, another place to visit is the Royal monastery of Huelgas and the Carthusian monastery of Miraflores Charterhouse. In Burgos the weather is temperate in summer and cold in winter. Temperatures can even be in the negatives. January is the coldest month with an average of 36.5 °F (2.5 °C) and August the hottest with an average of 66.2 °F (19 °C). It rains the most in spring. Burgos has a well-developed transport system with a large variety of services. Again, next to the Cathedral, there is an international bus station which connects Burgos with almost every region of Spain, but also European cities like Lisbon, Porto, Paris, Lyon, Amsterdam and others. Moreover, it links all main sights and tourists destinations. The city has also its own bicycle rental service, it is called Bicibur. The airport is 5 kilometres (3.11 miles) from the city centre and offers daily flights to Barcelona, Paris and Palma de Mallorca. The trains serve a lot of cities throughout the country. Finally, the city's current project is implementing a tram system.